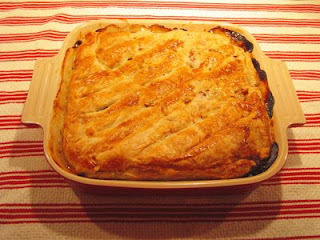 Did anyone see the turkey and sweet leek pie that Jamie Oliver did on his Christmas special? I have been dreaming about that pie ever since and I never make pie. Armed with a truck load of turkey left from Christmas day, I ventured out into the cold to find me some leeks and - a first for me - ready made puff pastry. Three shops later and recovering from the fact that two people in different supermarkets had never heard of puff pastry I brought my bounty home. This is a super easy recipe made more so by the ready made pastry (father forgive me for I have sinned). I already had boiled up the carcass for an all-cure stock in the morning – bones, celery, carrots, onion (with skin), bay leaves... you know the score – so used this in the recipe too. Timewise this is not a mid-weeker but one for a weekend feast. One thing I have noticed with Mr. Oliver is his portion control is like my aunt's from Sicily. I made 3/4 of the recipe and still ended up with enough for 8 (The other pie was out of shot). For this I cannot hate him. 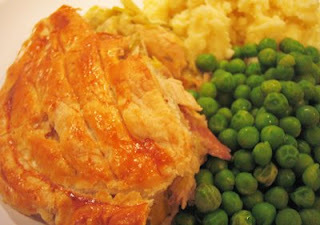 This was one heck of a tasty pie and a real winter warmer, served with a pile of mash and buttered peas. Sir Jamie of Oliver we salute you!